Welcome to CQ Communications, Inc. Proudly serving the “radio” community for over 36 years! CQ offers a vast array of hobby news and information via our websites and products including magazines, books, cds, dvds and calendars. Take a few minutes to explore the menu options and visit our other sites . . . . you’ll be glad you did! CQ Amateur Radio — The world’s leading independent magazine devoted to amateur radio. 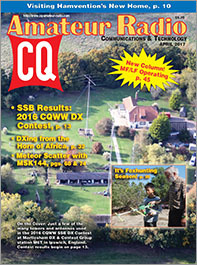 CQ is the magazine for active hams, with a focus on the practical. Every article is clearly written and aimed at involving you, the reader . . . whether it’s a story of operating from some exotic location, an article to deepen your understanding of ham radio science and technology, or a fun-to-build project that will have practical use in your ham shack. CQ Amateur Radio sponsors a wide range of operating awards and on-air contests. CQ is a monthly publication available in both print and digital editions. Click here to visit the CQ Amateur Radio website for a look inside the current issue! Click here to subscribe today and join us on our monthly journey through the broad and varied landscape of the world’s most fascinating hobby! Print edition, digital edition or both . . . the choice is yours! Click here to view a recent issue of CQ’s digital edition! CQ’s multimedia bookstore has something for every radio hobbyist, from the newcomer to the old-timer. Our books, CDs, DVDs and other products cover the full spectrum of hobby radio from antennas and propagation to contesting and DXing, as well as our highly popular CQ Amateur Radio Calendars. Our offerings include our own CQ books and DVDs as well as titles from other publishers. Click here to visit the CQ Online Store! Hobby books, CDs, DVDs and more!